Aaron Schuldiner (@shealiveson) is a freelance writer. He filed this report after taking in the first Army-Navy basketball game this year, a win for the Midshipmen on January 20. The two schools will play for the 91st time on the hardwood this Saturday in Annapolis. If you look for it, you can see joy on the faces of the Midshipmen and disappointment on the faces of the Black Knights, but for these few moments, there are no overt displays of celebration or sorrow. Basketball emotions are on hold while the players from both academies pay respect to principles that are bigger than the events of the past few hours. It’s a unique scene, and one that can’t help but reaffirm your faith in sportsmanship. 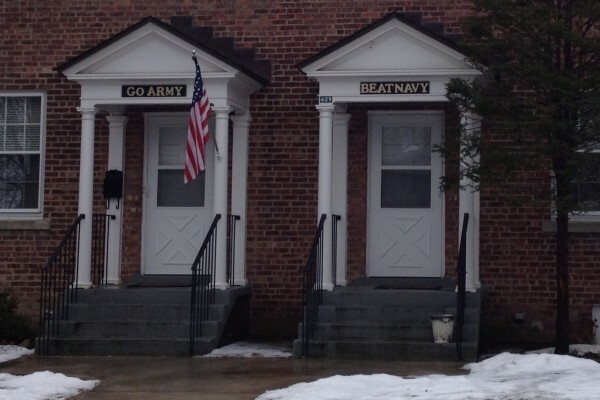 In a culture that’s often too preoccupied with the accomplishments of the individual to be bothered with the team concept, the Army-Navy basketball rivalry is a breath of fresh air. Among the cadets, the success of the team comes first. Where their futures will take them, it has to. The Hunt for an Automatic Bid: One of the most intriguing storylines at the outset of the season was whether an improved Patriot League could send two teams to the Big Dance in March. With both Lehigh and Bucknell receiving attention in various national mid-major rankings, it was possible that one or both could play itself into the at-large bid conversation. Lehigh squandered two of its best chances to impress the selection committee, dropping games at Baylor and Pitt. 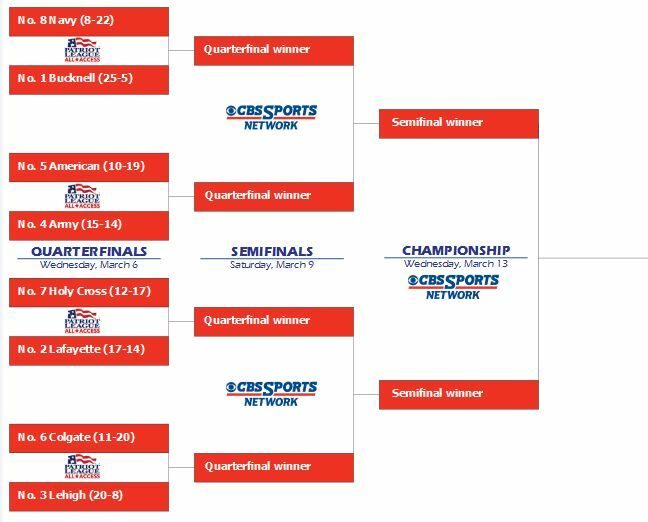 The Pitt loss was particularly damning because a win would have generated more chances against quality competition in the NIT Season Tip-Off semifinals and/or finals. The Mountain Hawks will have to win the Patriot League Tournament to get another shot to play with the big boys this March. Bucknell, on the other hand, had a more difficult non-conference schedule to begin with and has held up its end of the bargain with wins over Purdue, George Mason and New Mexico State. The Bison would likely need to win at Missouri on January 5 and submit a dominant conference season, but the door is still open. If the Bison win the Patriot League tournament, the point will be moot, but if they suffer an upset, the league could have two in the Field of 68. Wins From Top to Bottom: While Lehigh and Bucknell captured the preseason headlines, it bears repeating that six other Patriot League teams entered the season with high aspirations of their own. The Patriot League is an improved conference this year, with teams from top to bottom earning non-conference wins. Through Wednesday, the league had a cumulative record of 29-26. Many of those losses came in mismatches against schools from the power conferences, as was to be expected. But the league has been far from a doormat. The eight Patriot League schools have mopped up some of the other conferences on the East Coast, going a combined 23-5 against teams from the America East, CAA, Ivy League, MAAC, MEAC, and NEC. So while Bucknell’s wins against the Big Ten and WAC help elevate the standing of the whole conference, other schools are doing their part as well. There may be no hotter player in the country right now than C.J. McCollum, who has connected on 21 of his 38 three-point attempts this season. 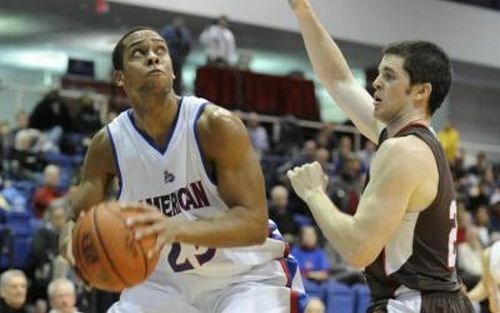 McCollum Sets Career Mark, Leads Nation in Scoring: Move over, Rob Feaster. Lehigh’s C.J. McCollum broke Feaster’s mark of 2,224 career points, which had stood since he graduated from Holy Cross in 1995. The Preseason AP All-American broke the mark during a 26-point effort against Sacred Heart on Sunday. McCollum has more than 20 games to pad his record. After he poured in 25 in the second half at Quinnipiac on Wednesday night, McCollum’s 26.3 points per game lead the nation. Eighteen NBA scouts showed up for Lehigh’s opening game against Baylor. And in case you think all 18 were there just to get a first look at Isaiah Austin, 20 more showed up for Lehigh’s second game against Robert Morris. Most preseason projections had McCollum as a first round pick in this summer’s draft, and his play so far has only helped his stock. Most notably, McCollum has improved his three-point shooting. He has hit 21-of-38 shots from beyond the arc, good for 55.3 percent. C.J. And Moose: You’ve read about them all summer, and will continue to do so even more during the season. C.J. McCollum and Mike Muscala have developed into household names in the college basketball community on a national scale, not just in the charming land of mid-major basketball. McCollum has garnered more press, understandably, due to Lehigh’s victory against Duke in the NCAA Tournament. His decision to test the waters of the NBA Draft — he smartly did not hire an agent — gave him the opportunity to return to Lehigh. Muscala has earned his fair share of press as well, being named as a Top 100 player by CBS Sports and a Mid-Major All American by NBC Sports’ College Basketball Talk. A Two-Bid league? An ambitious thought to be sure, but a possibility, albeit a small one. Prior to delving into what has to break right for either Bucknell or Lehigh to garner an at-large berth, let’s take a look at Bucknell’s 2005-06 resume: RPI of 42, 2-3 versus the RPI top 50 with wins over Syracuse and St. Joseph’s, 23rd-ranked non-conference schedule, and the only loss that could be considered a “bad loss” was to Santa Clara, which had an RPI of 184. The Bison went on to defeat Holy Cross in the Patriot League championship, earning an automatic bid to the NCAA Tournament, but what if Bucknell had lost? With their resume, they would have almost assuredly earned an at-large bid. Fast forward seven years, and one has to wonder if a similar scenario may play out. 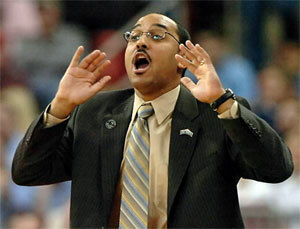 Could Lehigh or Bucknell earn an at-large bid? It’s more likely that Bucknell would, considering the Bison’s non-conference schedule is better than Lehigh’s and there are more opportunities to pick up resume-building wins, but one thing is certain: It is possible for a Patriot League team to earn an at-large bid. The notion that it all comes down to “three games in March,” while the case most years, may not be the case in 2012-13. C.J. McCollum (left) and Mike Muscala are two of the many reasons why the Patriot League is one to watch this season. Reed, Paulsen Moving Up? Doctor Brett Reed (side note: Reed received his PhD from Wayne State University in Instructional Technology) and Dave Paulsen have proven to be exceptional recruiters and developers of talent, and the results on the court speak for themselves. Complete conjecture, but it seems they both are on the inside track to move up in the coaching world, especially with their respective star players graduating in the spring of 2013. Reed, a native of Waterford, Michigan, was rumored to have been a candidate for the Central Michigan job (Keno Davis is now the head man for the Chippewas) along with other MAC jobs, while Paulsen was speculated to be a candidate for the Dayton job in 2011. Paulsen, however, was awarded with a five-year extension to his contract last year, so it looks like he will remain in Lewisburg for the foreseeable future. 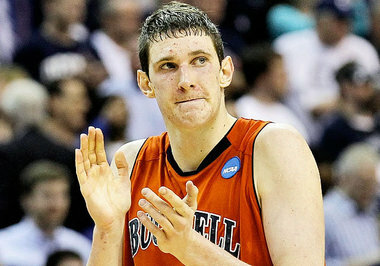 Paulsen has won everywhere he has coached: St. Lawrence, Le Moyne, Williams, and now Bucknell. Reed is one of the brighter young basketball minds in the coaching ranks, and in my mind the smoothest and most eloquent speaker in the game. Kevin Doyle is the RTC correspondent for the Patriot League and author of the weekly column “The Other 26”. You can find him on Twitter at @KLDoyle11. Grading Langel and DeChellis—It is very early in their time at their new schools, but both Matt Langel and Ed DeChellis have both gotten off to solid starts. At Colgate last season, Emmett Davis did not achieve his second win of the season until January 17, Langel already has two. Meanwhile at Navy, DeChellis has the Middies sitting at 2-3, with competitive losses to Siena and Tulane. To truly assess both Langel and DeChellis, one needs a greater sample size. We’ll have a better idea how each coach has done after the non-conference portion of the schedule. Charles Hinkle Steps Up—Entering the season, Jeff Jones knew that his senior transfer from Vanderbilt would have to shoulder much of the scoring load that Vlad Moldoveanu left behind upon his graduation, and Hinkle has delivered in a big way. Through five games, Hinkle is averaging 24.8 points and hitting 9.6 free throws per contest, both are top five nationally. 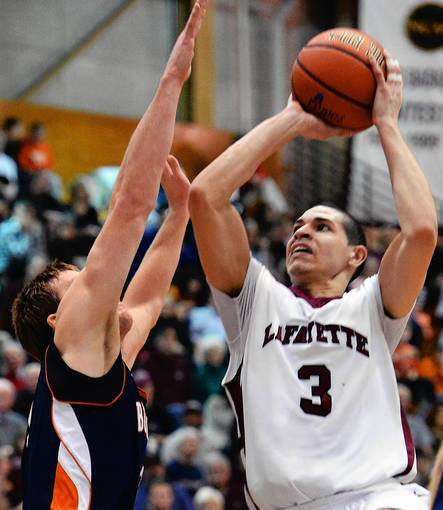 Jim Mower Reaches 1,000—Lafayette senior guard Jim Mower surpassed the 1,000 point mark in the Leopard’s 85-74 victory of Fairleigh Dickinson. It was a night that Mower will not soon forget as he dropped in 37 points and drilled 10 three points, in conjunction with joining the 1,000 point club. Mower has flourished in Fran O’Hanlon’s offense that is largely built upon outside shooting. Mid-Major Top 25—Bucknell received six votes in the latest Mid-Major Top 25 poll, a significant drop-off from where they began the season. Tough 12-point losses to Minnesota and Vanderbilt to begin the year can be attributed to the drop, but the Bison have gotten back on track with two straight wins. Expect to see them teetering on the Top 25 in the coming weeks. Joe Lunardi’s Bracketology—In his latest Bracketology (November 9)—it really is far too early to take this seriously, but is fun to look at anyways—Lunardi has Bucknell as a 15 seed in the Midwest region playing Pittsburgh in the second round. Considering Pittsburgh recently lost to fellow mid-major Long Beach State, and the Bison have upset the Panthers just several years ago, this may be a decent match-up for Bucknell. Team of the Weeks (Nov. 7-Nov. 23): Lehigh—Dr. Brett Reed and Co. had St. John’s on the ropes for much of its opening game, but a late Red Storm run proved to be too much to overcome. Despite losing to St. John’s—a game that many would claim Lehigh should have won—the Mountain Hawks currently sit at 4-2 with solid wins over Liberty and Eastern Kentucky. The margin of victory is what has been very impressive in their four victories as they have outscored opponents by an average of 17.75 points per game. Player of the Weeks (Nov. 7-Nov. 23): Charles Hinkle—Hinkle has done it all for Jeff Jones and the Eagles. American was in desperate need of a reliable scorer entering the season and Hinkle has been just that. In American’s latest game against Quinnipiac, Hinkle poured in 31 points and hit 15 of 19 free throws to lead the way. Milan Brown And Holy Cross Struck A Surprise Win At Boston College This Week. Although the Bison do not sport an impressive record at 2-2, their games against Minnesota and Vanderbilt were both very competitive well into the second half, and they have taken care of business rather easily against St. Francis (PA) and Marist. Their upcoming schedule is less daunting than the first two games of the season were so expect Bucknell to get back to their consistent winning ways in the coming weeks. Kevin Doyle is the RTC correspondent for the Patriot League and author of The Other 26, an RTC column which examines the teams from the 26 non-power conferences and their impact on the game at a national level. You can find him on Twitter @KLDoyle11. 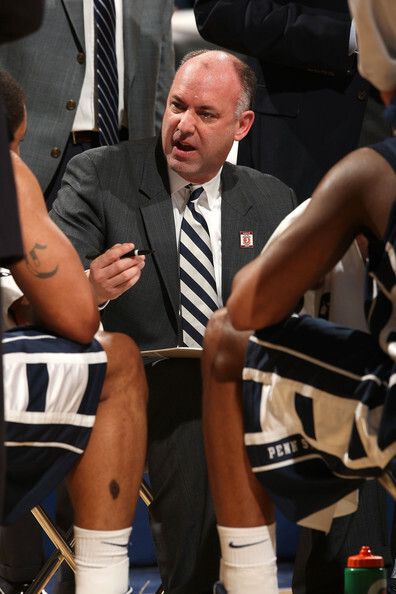 From the Big Ten to the Patriot League—It is not all that often that Patriot League hoops is the epicenter of college basketball discussions, but this was the case in late May as Ed DeChellis departed as head coach of Penn State in favor of Navy. Yup, that Navy. The Midshipmen haven’t reached the Big Dance since 1998 and are only a small blip in the basketball world thanks to alumnus David Robinson, but DeChellis’ seemingly surprise move made Navy a household name for some of the summer months. Something tells me that playing in Hamilton, New York, on a Saturday afternoon will be a little different than, say, a rocking Kohl Center for DeChellis. Stability at Holy Cross—Although Milan Brown greatly struggled as the Crusaders head coach in his first season—HC finished with a subpar 8-21 mark—there is the reassurance of knowing the program will be in the same hands for consecutive years for the first time since the 2008-09 campaign. When watching the Crusaders compete in the non-conference portion of their schedule last year, Brown struggled to implement his man-to-man defensive philosophy to a team that was more accustomed to playing a zone. It is safe to assume that after a full year under Brown, Holy Cross will have a greater sense of identity on both the offensive and defensive ends of the floor, something that was certainly lacking last season. A Movement to Youth at Colgate—I doubt that there is a readily accessible statistic out there for this sort of thing, but I would venture to guess that Matt Langel and his staff at Colgate are the youngest in the nation. Emmett Davis never found success while coaching the Raiders, but Langel and his crew of young assistants may be the perfect recipe for success that it will take to win at Colgate. A spark of energy seemed to be lacking under the previous regime, and having four coaches who are young and looking to prove themselves should be the catalyst that jumpstarts Colgate.